RIO DE JANEIRO, BRAZIL – When it comes to real estate, visual layouts are instrumental in understanding dimensions, arrangements, and proportions of properties, especially in lieu of seeing the space in person. Now English expatriate Charlie Crocker has launched a Copacabana-based business, Piso Plano Design, specializing in providing professional floor plans for both residential and commercial properties. Charlie Crocker of Piso Plano Design, photo courtesy of Charlie Crocker. Piso Plano Design began when Mr. Crocker, who had worked previously for five years as a surveyor for the London real estate firm Jones Lang LaSalle, decided he needed a change. Rio was his first choice. Crocker was born in Rio but has lived abroad most of his life, having left the city at age four. “It’s an amazing city,” Crocker told The Rio Times. 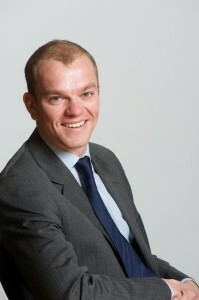 Shortly after Crocker and his girlfriend Lizzie Ward, a graphic designer, arrived in Rio, he started Piso Plano Design. First Crocker inspects each property and makes a complete survey of the measurements according to the Código de Prática RICS de medição, 6ª Edição (RICS Code of Measuring Practice, 6th Edition). Then they create floor plans with a team of graphic designers which can be customized with client logos or preferred language depending on the clients’ needs. Crocker explained that floor plans help buyers get a better spatial sense of the property and an understanding of what fits where. He had found online listings lacking while originally looking for a home to buy. “You don’t get a feel for the property,” said Crocker when discussing pictures that only show parts of rooms. […] We are trying to change this and save everyone a lot of time so they don’t have to walk around ten to fifteen properties,” Crocker said. 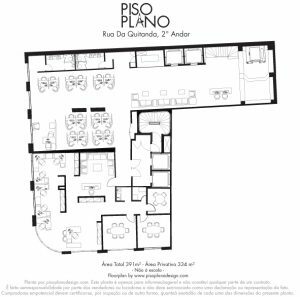 Example of a Commercial Floor Plan, image courtesy of Piso Plano Design. “It is an interesting idea that certainly will have some value for the end customer and potentially make the evaluation process easier for all involved,” Juliana Guzman, co-founder of Rio Exclusive, told The Rio Times. So far, Crocker has helped international clients and estate agents who are accustomed to seeing floor plans included in real estate marketing material. He has also worked with clients who needed floor plans to show the planning commission and banks for home remodeling and extension approvals. Crocker and Piso Plano Design are also evolving and expanding with the addition of a photographer and architect to the team. Crocker hopes to further grow in the future by offering fuller marketing packages, more architectural services and possibly virtual tours.